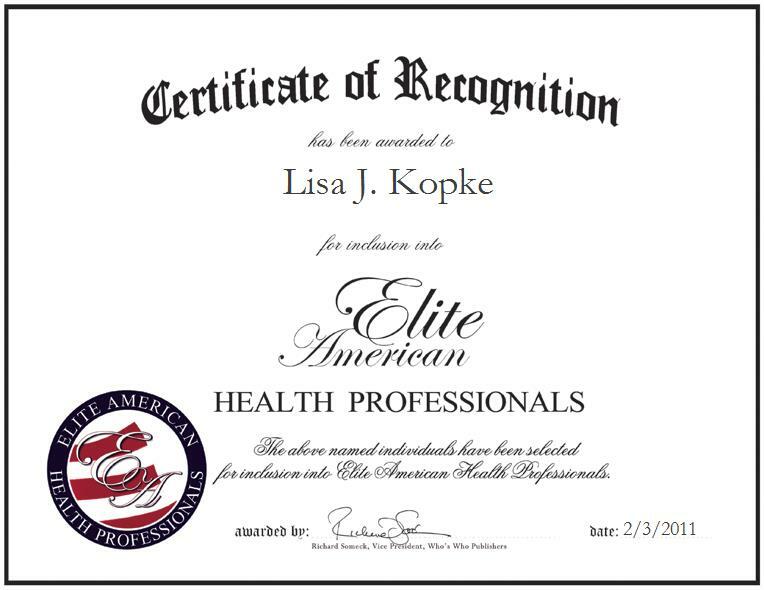 Arkdale, WI, February 3, 2011, Lisa J. Kopke, Licensed Massage Therapist for Ms. Lisa’s Mobile Massage, has been recognized by Elite American Health Professionals for dedication, leadership and achievements in massage therapy. Lisa J. Kopke discovered her calling in therapeutic massage while caring for her father, a diabetic who needed it to increase circulation in his arms, legs, hands and feet. Now, others can experience the benefits of her healing touch through Ms. Lisa’s Mobile Massage. The eponymous operator of this mobile massage center, Ms. Kopke has established herself far and wide as an expert in therapeutic massage for pain relief and stress management. She has been in practice for seven years, and specializes in performing Swedish, pregnancy, trigger point and deep tissue massage for a range of clients. A Certified Massage Therapist, Ms. Kopke earned a diploma in 2004 from the Lakeside School of Massage Therapy. Additionally, she holds a license in massage therapy from the State of Wisconsin, certifications in CPR and First Aid, and a certification in massage therapy from the National Certification Board for Therapeutic Massage & Bodywork. Ms. Kopke is a member of the Adams County Chamber of Commerce, Adams County Home and Community Educators, and the American Massage Therapy Association. Ms. Kopke is a generous supporter of The Red Hat Society, the Alzheimer’s Association, and the American Cancer Society’s Relay For Life. When she is not working, she enjoys making jewelry, crocheting, and spending time with her husband and their two children. As she moves forward in her career, she plans to pursue an Associate of Arts in massage therapy and expand her business. To learn more about Ms. Lisa’s Mobile Massage, please visit http://www.mslisasmobilemassage.com.